When you have Vancouver Glass Company install your new or replacement tub or shower enclosure, we make sure to get the measurements just right. If you are a “Do-It-Yourself” customer and are interested in knowing how your measurements can help us get you the perfect pieces – just follow this handy guide. On tub and showers measure wall to wall along the sill, and wall to wall at unit height. On showers measure wall to wall along sill and wall to wall at unit height. 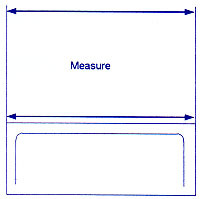 When measuring stall or tub, centerline measurements are necessary for proper fit of shower door or tub enclosure. Measure from wall to wall on the center of the curb or threshold. The drawings below indicate where you should measure. Out of plumb walls require curb and unit height measurements. Bath tub or shower with step panel. 90 Degree corner shower stall. Bath tub or shower stall with stub wall.